Flashback to 1990! Our artist was doing some heavy house keeping and came across this old folder from 1990 and ABNRML's Los Angeles days. 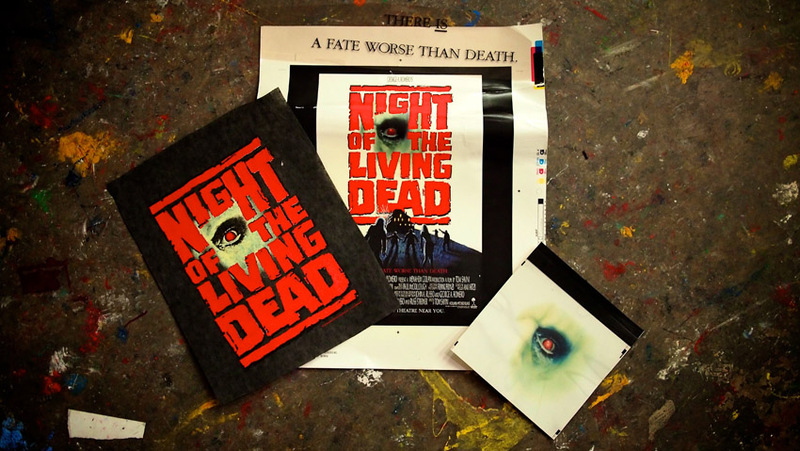 Night of the Living Dead! ABNRML used to print a lot for huge Hollywood premieres. These old files are really neat because sometimes you get a glimpse of how things worked decades ago before art files were zipped up and shot through cyber space. We have seen old screen films and positives like this from Superman, Aliens, Batman, Terminator 2 and a few others. This little Halloween appropriate package was a nice treat so we thought we would post it! Happy Halloween! John Warner of J Dub All Stars is well connected into some legendary rock musicians. 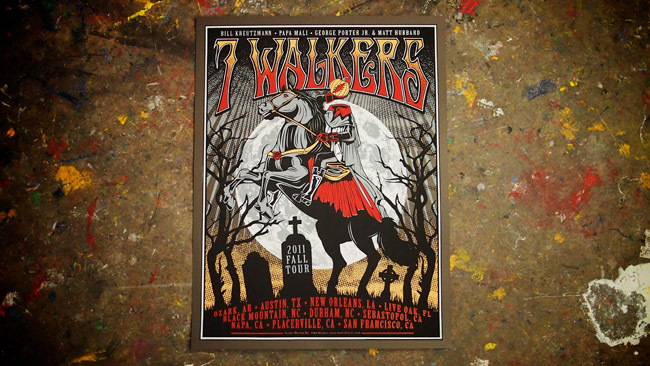 This rush print for the 7 Walkers tour is no exception. Backed by Bill Kreutzmann of The Grateful Dead, 7 Walkers will be selling these awesome 5-color screen prints throughout their tour. 100 of these were screened on 19"X25" French Paper cover stock. 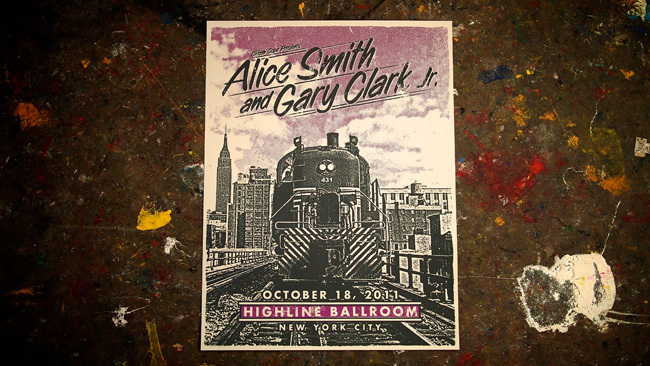 Citizen Cope fans should collect themselves and head on over to the Highline Ballroom in New York City tonight (10/18/11) to check out Alice Smith and Gary Clark, Jr. Mr. Cope presents this show and this 19"X25" 2-color J Dub All Stars print. A very limited number of these 2-color posters were screened for tonight's performance and will be available at the show. Printed on high quality French Paper cover stock. Check out this hot, hot, hot pink print for Duran Duran! This awesome limited edition Live Nation screen print was designed by T-Bone & Aljax and printed and produced by ABNRML.com. It is a 3-color print on 12.5"X19" insulation pink French Paper cover stock. This print was not on sale to the public and is a special gift from Live Nation to Duran Duran for their performance at The Tower Theater in Philadelphia, PA on Monday, October 17th 2011. Only 35 of these special prints were produced. You can pick one up by clicking here! This is the largest poster job ABNRML has ever done! This 6-color w/ metallic silver print was designed by John Warner over at J Dub All Stars for none other than Warren Haynes! You may know Warren Haynes from such rock outfits as Gov't Mule, The Dickey Betts Band, The Allman Brothers and Phil Lesh & Friends. He is a rock guitar icon and this 6-color 19"X25" print on French Paper cover stock does him justice! This poster will be available throughout the tour from the band's merch. 400 are being printed as I type! 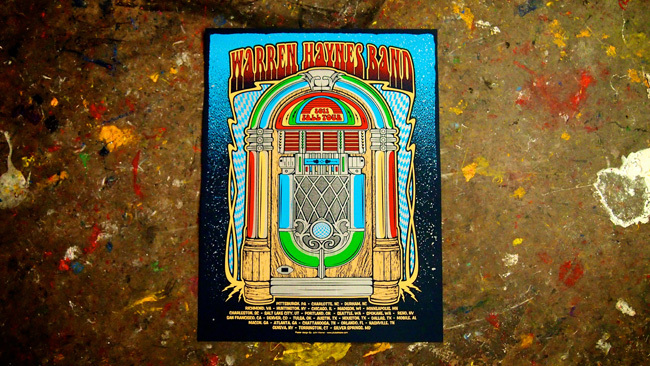 Stay tuned for more Warren Haynes prints!